Epanterias is a dubious genus of theropod dinosaur from the Kimmeridgian-Tithonian-age Upper Jurassic upper Morrison Formation of Garden Park, Colorado. It was described by Edward Drinker Cope in 1878. The type species is Epanterias amplexus. 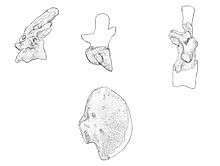 This genus is based on what is now AMNH 5767, parts of three vertebrae, a coracoid, and a metatarsal. Although Cope thought it was a sauropod, it was later shown to be a theropod. Gregory S. Paul reassessed the material as pertaining to a large species of Allosaurus in 1988 (which he classified as Allosaurus amplexus). Other authors have gone further and considered E. amplexus as simply a large individual of Allosaurus fragilis. In 2010, Gregory S. Paul and Kenneth Carpenter noted that the E. amplexus specimen comes from higher in the Morrison Formation than the type specimen of Allosaurus fragilis, and is therefore "probably a different taxon". They also considered its holotype specimen not diagnostic and classified it as a nomen dubium. 1 2 Cope, Edward Drinker (1878). "A new opisthocoelous dinosaur". American Naturalist. 12 (6): 406. doi:10.1086/272127. 1 2 Osborn, Henry Fairfield; Mook, Charles C. (1921). "Camarasaurus, Amphicoelias, and other sauropods of Cope". Memoirs of the American Museum of Natural History, New Series. 3 (3): 247–387. ↑ Paul, Gregory S. (1988). "Genus Allosaurus". Predatory Dinosaurs of the World. New York: Simon & Schuster. pp. 307–313. ISBN 0-671-61946-2. ↑ Holtz, Thomas R., Jr.; Molnar, Ralph E.; Currie, Philip J. (2004). Weishampel, David B.; Dodson, Peter; Osmólska Halszka (eds. ), eds. The Dinosauria (2nd ed.). Berkeley: University of California Press. pp. 71–110. ISBN 0-520-24209-2. ↑ Paul, G.S. and Carpenter, K. (2010). "Case 3506: Allosaurus Marsh, 1877 (Dinosauria, Theropoda): proposed conservation of usage by designation of a neotype for its type species Allosaurus fragilis Marsh, 1877." Bulletin of Zoological Nomenclature, 67(1): 53-56.